November was supposed to be recover the desk area month. I am happy to report that some of these items are newly deposited, but it is obvious we have not achieved recovery yet. 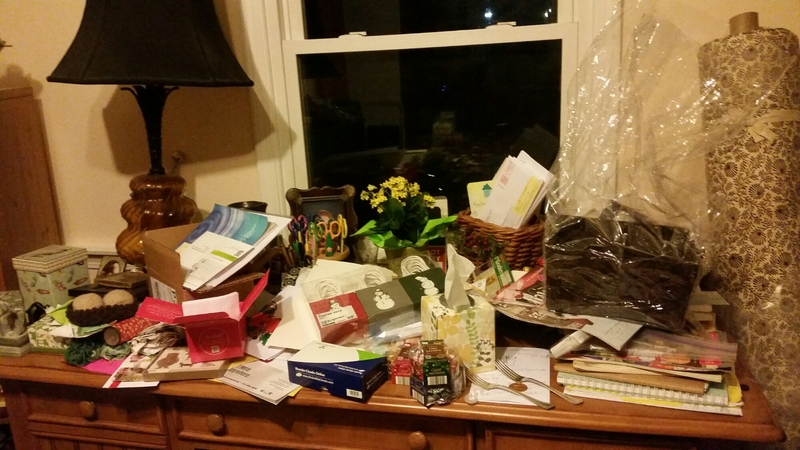 So now December becomes Tidy the Desk month and we try again. What is the space supposed to be? I keep coming back to this question. Am I even a desk person? I like to write letters at the desk. And to pay bills. And it’s a good surface for little crafty projects that need a flat space. The window is good for inspiring daydreams. If the desk was gone, what would I want in that space? This is one of my favorite house-y questions. What belongs here? Can it be an empty space? Are there items living on the desk that couldn’t live elsewhere? I want the desk. I want to be a desk person. Let’s see how December plays out.